The coastal resort of Santa Monica has much to offer those wishing to stay in this area of California, with plentiful beachfront hotels and accommodation options, close to the metropolis of Los Angeles. Hotels are always within minutes of tourist attractions, shopping centers, restaurants and literally miles of beachfront, including the city's famous Santa Monica Beach. 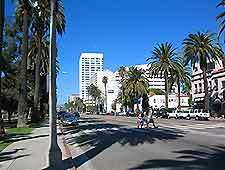 Much of the accommodation in Santa Monica is well connected by the Big Blue Bus or TIDE Shuttle, which provides reliable transport along the Main Street and Ocean Avenue areas. A number of larger central hotels and significant lodging chains also come with their very own shuttle bus service. Hotels in Santa Monica tend to be at their busiest during the summer months and rates are reduced outside of this season, with the cheapest lodging being available from October through March. The sunny Californian climate ensures that the best accommodation reliably remains busy throughout the year. Santa Monica offers around 40 hotels and almost 4,000 guest rooms, which include a host of popular chains and luxury hotels, many of which are situated along the Pacific coastline. The most popular accommodation can generally be found within the city center, around the Third Street Promenade, on the Santa Monica Place and along Montana Avenue. Hotels close to the beaches are especially desirable, particularly around Venice Beach and the huge expanse that is Santa Monica Beach. Located along the Ocean Front Walk and on the site of the Original Muscle Beach, the International Chess Park is an interesting and unusual coastal attraction worth looking out for if you choose lodging in this part of the city. 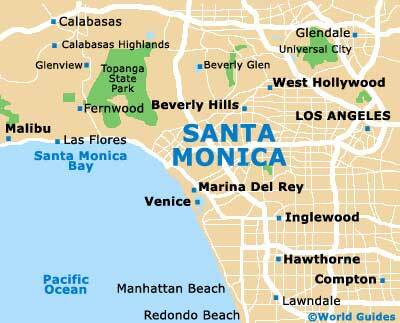 Other popular lodging options in the Santa Monica area are based within the nearby towns, cities and Californian coastal resorts of Beverly Hills (8 miles / 13 km), Inglewood (11 miles / 18 km), Marina Del Rey (5 miles / 8 km) and downtown Los Angeles (16 miles / 26 km). 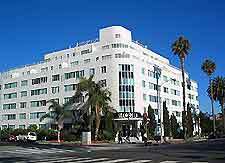 Mid-range hotels in Santa Monica can be found around the Third Street Promenade, Broadway, the Ocean Front Walk, the Pico Boulevard and the Santa Monica Boulevard. Located on Colorado Avenue, the Wyndham comes highly recommended and stands alongside the pier. Close by and located on Ocean Avenue, the Hotel California is just a stroll from the beachfront, while the award-winning Ambrose Hotel on 20th Street at Arizona stands next to the Wilshire business district and is famous for its eco-friendly accommodation. Luxury hotels are situated along Fourth Street, Ocean Avenue, the Ocean Way, the Pico Boulevard and the Wilshire Boulevard, with many offering superb views of the coastline and the Santa Monica Pier. Some of the best four-star accommodation comes in the form of the centrally located Shangri-La, the Viceroy Hotel, the Le Merigot (JW Marriott) and the Hotel Oceana, all of which stand along Ocean Avenue and in close proximity to the beach.